The United Nations' police action began in 1950 and lasted three years, when an armistice agreement was signed at Panmunjom. 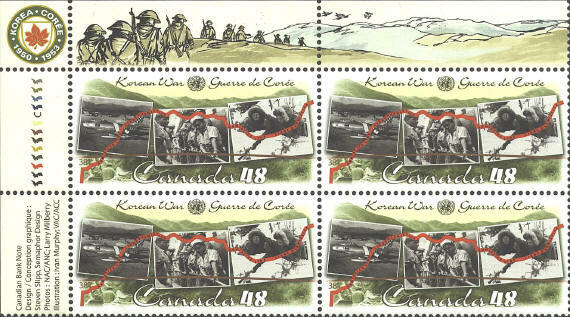 The stamp has pictures of Canadian army, navy and air force set against a background of the Korean landscape. The map features are the green and red lines. The green line represents the 38th parallel, and the red line indicates the redrawn armistice line. Thanks to Bradley McInnis of Mississauga, Ontario (whose topic is horology on stamps) for sending the stamps to me.